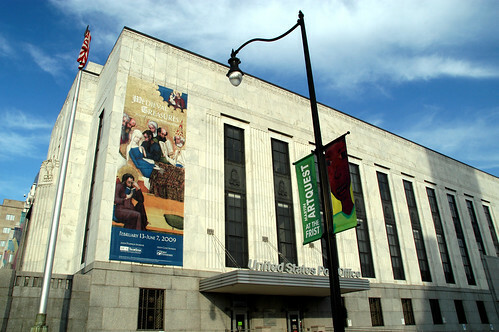 Been wanting to check out the new Georgia O’Keeffe And Her Times exhibit at the Frist? Clear your schedule, because the Frist is free both tomorrow (October 14) and Sunday (October 18) for First Tennessee Free Day and Free Family Day, respectively. First Tennessee Free Day will provide free admission to the Frist during the day tomorrow (10am-5:30pm), thanks to First Tennessee bank. Free Family Day on Sunday goes from 1pm-5:30pm, and includes a variety of musical demonstrations, art stations and story times. As always, the Frist Center provides free admission to college students with ID on Thursday and Friday nights from 5-9pm, and free admission for anyone on Mondays (in 2009) with a canned food donation for Second Harvest Food Bank. Three cheers for the Frist (and their sponsors) for their generosity to the Nashville community! Contribute 2009: Buy Local, Nashville!